Golden Coast is an authorised distributor of LaMotte products to the UK wet leisure industry. Golden Coast is an authorised stockest and distributor of LaMotte pool and spa test strips to the UK wet leisure industry. 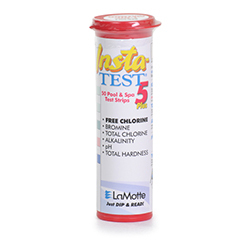 LaMotte 1-dip test strips allow the user to just dip the strip into the water and receive accurate, instant results. Their new formula is designed for stable colour development to allow adequate time to match the very distinct colours along with preventing cross-contamination between pads. 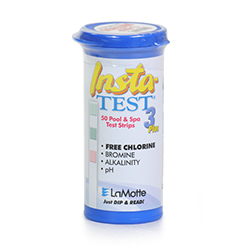 The Insta-TEST 3 Plus pool & spa strip measures Free Chlorine, Bromine, Total Alkalinity and pH. This test strip is a dip-n-read strip with instant results. 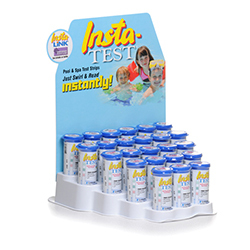 The Insta-TEST 5 Plus pool & spa strip measures Free Chlorine, Bromine, Total Chlorine, Total Alkalinity, pH and Total Hardness.